Kannapolis has been talking about the proposed widening of Mooresville Road, which includes wider outside travel lanes for cyclists, and proposed road diet and buffered bike lanes on Loop Road for several months. 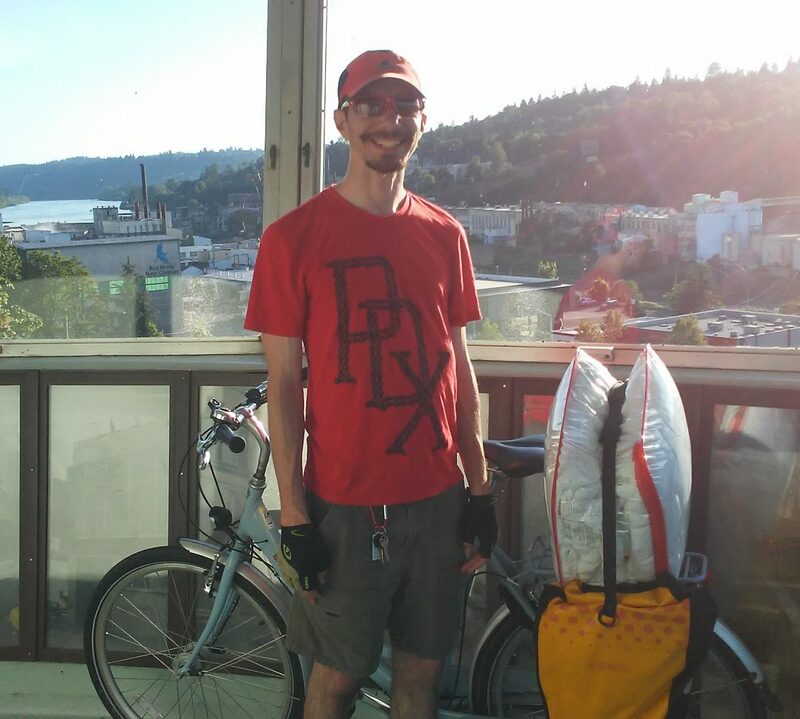 However, very few people have been talking about the missing bike connection between these two projects. I hope this blog post will provide Kannapolis and NCDOT with a potential redesign to safely and conveniently connect both projects. Before I discuss my redesign, I want to make sure everyone knows where the missing bike connection is located in Kannapolis. I also want to provide a short overview of who owns Loop Road and Mooresville Road because I feel this has impacted both projects. Where is the missing bike connection? In order to show the location of the missing bike connection, I first need to show how the missing bike connection is connected to the Loop Road and Mooresville Road projects. The below map shows both projects. Starting from the left side of the map, the Mooresville Road project begins at Kannapolis Parkway and concludes at Dale Earnhardt Blvd, which is located where the red highlight is. The Loop Road project begins at West C Street, which is where the white dot is located above the orange highlight, and concludes at Main Street, which is where the pointer is located at 100 Loop Road. The missing bike connection, which can more easily be seen in the next map, is located between the Mooresville Road project and Loop Road project. 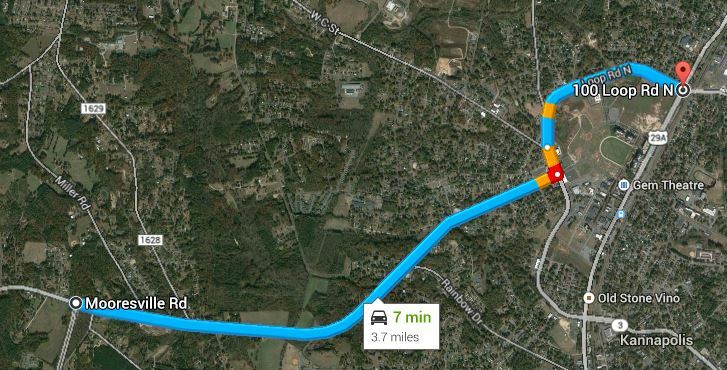 Where are the Mooresville Road and Loop Road projects located? The below map shows where the proposed project on Loop Road ends at West C Street/South Walnut Street, which is where Loop Road changes names to Dale Earnhardt Blvd. The below map also shows where the proposed project on Mooresville Road ends at Dale Earnhardt Blvd, which is just before Mooresville Road changes names to Watson Crick Drive. 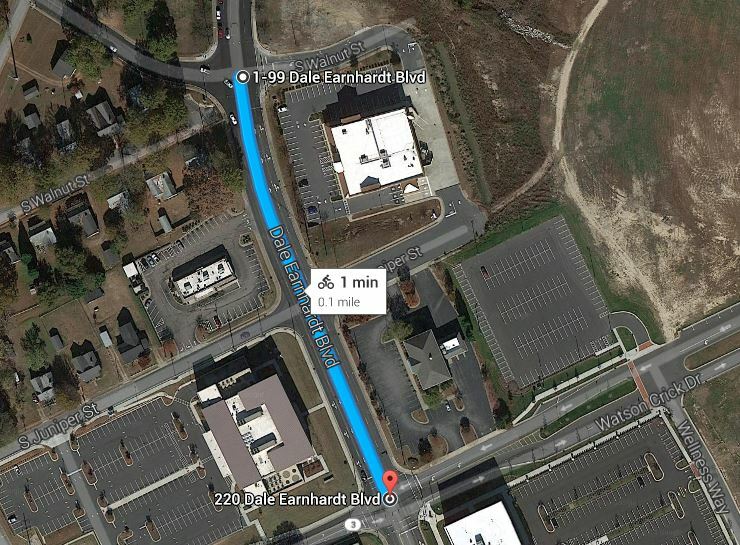 The missing bike connection, which is highlighted in blue, is located on Dale Earnhardt Blvd between West C Street/South Walnut Street and Mooresville Road/Watson Crick Drive. With the location in mind, below are the Mooresville Road and Loop Road project maps to provide proof that the missing bike connection is real. Since the Mooresville Road project maps are PDFs, I can’t show the maps so I have provided the links to the maps below. As NCDOT’s notice shows, there is a public hearing about the Mooresville Road widening project on Wednesday, July 9 from 4-6:30pm at the Cabarrus Health Alliance Building, which is located at 300 Mooresville Road in Kannapolis. I will be in Silver Spring, MD so cannot attend, but I encourage anyone interested in this project to attend. Below are the Loop Road project maps as of February 11, 2014. Since public hearings are still occurring for both projects, all the project maps are subject to change. Do you see the missing bike connection between the Mooresville Road project and the Loop Road project? The sections along Loop Road where the proposed road diet and buffered bike lanes could be installed may be transferred from NCDOT owned to City of Kannapolis owned. The sections along Mooresville Road where the proposed wider outside travel lanes for cyclists could be installed are currently NCDOT owned. Since both projects are not along sections of road that are city owned, I feel it is creating a difficult situation to make sure there is a safe and convenient bike connection between the two projects. As of the resolution that was approved by Kannapolis City Council on Monday, June 23, Kannapolis is requesting NCDOT to abandon sections of Loop Road and Dale Earnhardt Blvd from State maintenance. This includes the entire project area for the road diet and buffered bike lanes on Loop Road and the missing bike connection on Dale Earnhardt Blvd. If NCDOT accepts the Kannapolis City Council’s request, these sections will be added to the City of Kannapolis’ Street System for maintenance. 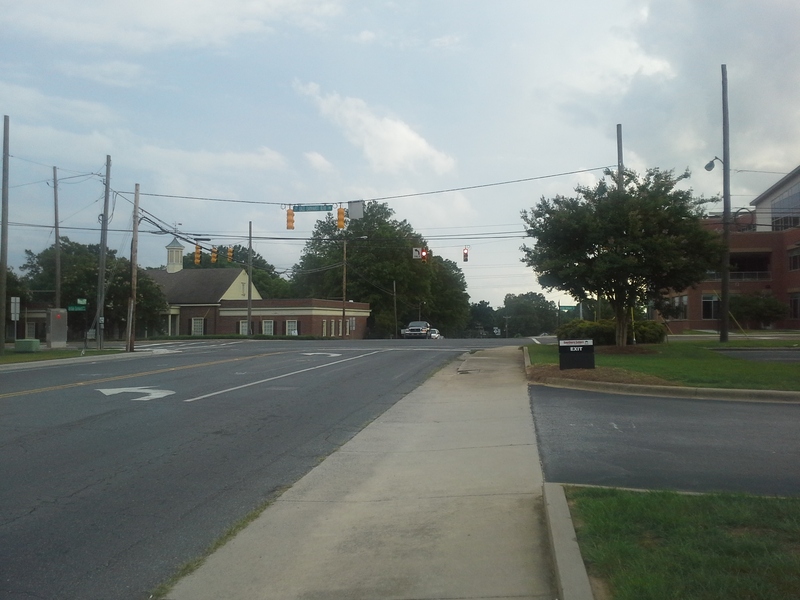 However, from what I have observed on the project maps, it doesn’t appear that this means the road diet and buffered bike lanes on Loop Road will be extended beyond the intersection of Loop Road and West C Street/South Walnut Street to the intersection of Dale Earnhardt Blvd (Loop Road changes names) and Mooresville Road/Watson Crick Drive. Since the Loop Road project will still end at West C Street/South Walnut Street, the missing bike connection will still exist. After speaking with individuals involved in the Loop Road project, I discovered they have an alternative plan to create the bike connection between both projects. Instead of extending the road diet and buffered bike lanes to the intersection of Mooresville Road/Watson Crick Drive, they want to end the road diet and buffered bike lanes at West C Street/South Walnut Street and route cyclists onto a multi-use path. They want to create this multi-use path through widening the sidewalk shown in the below photo. As one can see, there is a power line adjacent to the sidewalk. It probably is expensive to relocate the power line so the sidewalk can be widened for the creation of the multi-use path. The Mooresville Road project, which is owned by the NCDOT, introduces another issue. Since the City of Kannapolis doesn’t own the sections of Mooresville Road where the proposed project is located, I feel it has less control over the proposed wider outside travel lanes for cyclists on Mooresville Road than it would have if these sections were owned by the city. One example of this can be seen in how the Mooresville Road project ends at Dale Earnhardt Blvd, which is just before Mooresville Road changes names to Watson Crick Drive. Since it would make the missing bike connection from the Loop Road project safer and more convenient, I would like NCDOT to extend the Mooresville Road project from Dale Earnhardt Blvd to Laureate Way. With the location and ownership details discussed for both projects, I will begin to discuss my proposed alternative route to create a safe and convenient bike connection between the Loop Road project and Mooresville Road project. 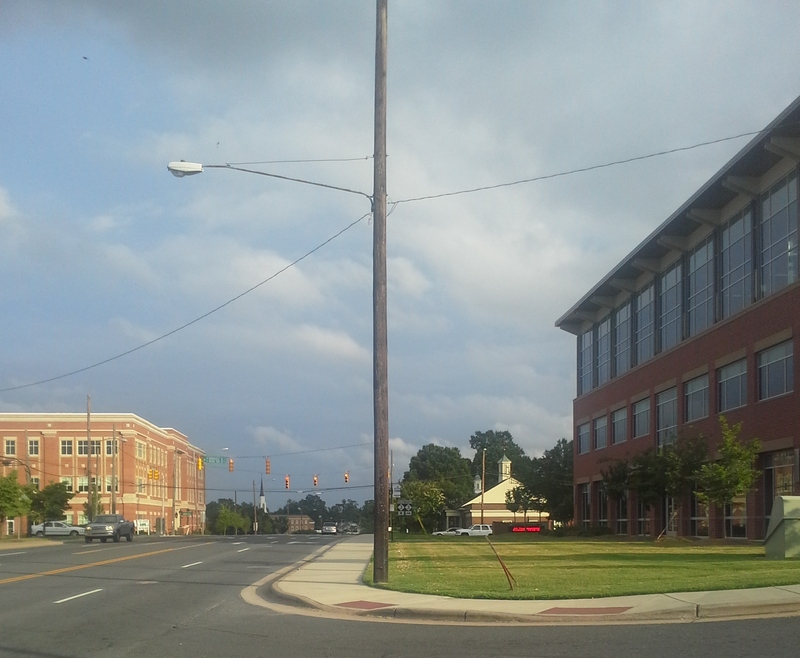 This redesign assumes the City of Kannapolis and NCDOT cannot connect the two projects using the travel lanes on Dale Earnhardt Blvd. Since I don’t yet (Portland State University has classes that teach photoshop) have photoshopping skills, imagine what the intersection of Loop Road/Dale Earnhardt Blvd and West C Street/South Walnut Street, which is shown below, would look like with a two-stage left turn box with bike detection. While I would prefer four two-stage left turn boxes be installed at this intersection because there are four possible locations to turn left, two boxes are needed to complete the alternative route that I am designing. One of these boxes needs to be installed for cyclists turning left from Loop Road onto South Walnut Street and the other box needs to be installed for cyclists turning left from South Walnut Street onto Dale Earnhardt Blvd. This redesign, along with the rest of my redesign, should encourage “interested but concerned” cyclists to bike between where the buffered bike lanes end on Loop Road and the wider outside travel lanes for cyclists start on Mooresville Road. Inspiration for the words “Put a two-stage left turn box with bike detention on it!” in the caption for the below photo came from Complete Blocks. Complete Blocks is a cool project co-founded by Aleksandra Borisenko and Keihly Moore, who graduated from UNC Charlotte and now work for the Lawrence Group. Check out their website to see all the amazing complete block redesigns! 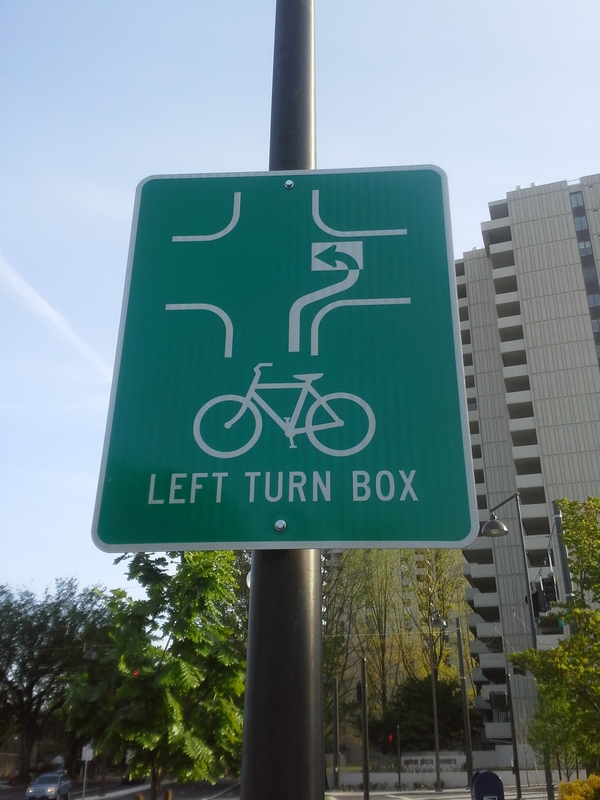 Put a two-stage left turn box with bike detention on it! 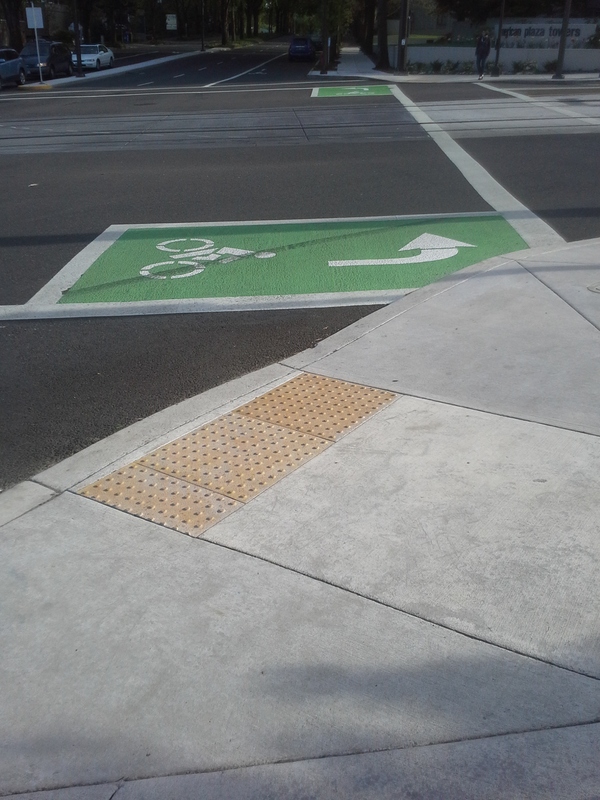 The below photo shows two-stage left turn boxes in Portland, OR. 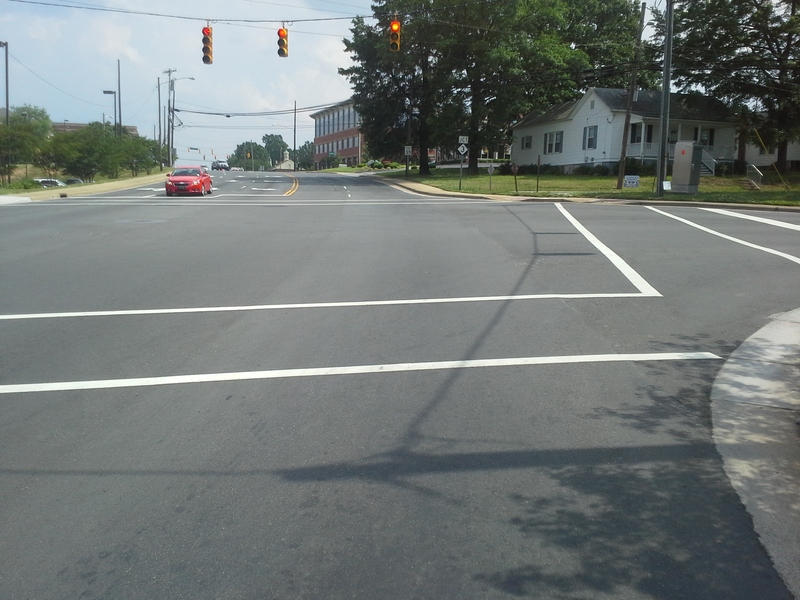 A similarly designed two-stage left turn box could be installed in Kannapolis. 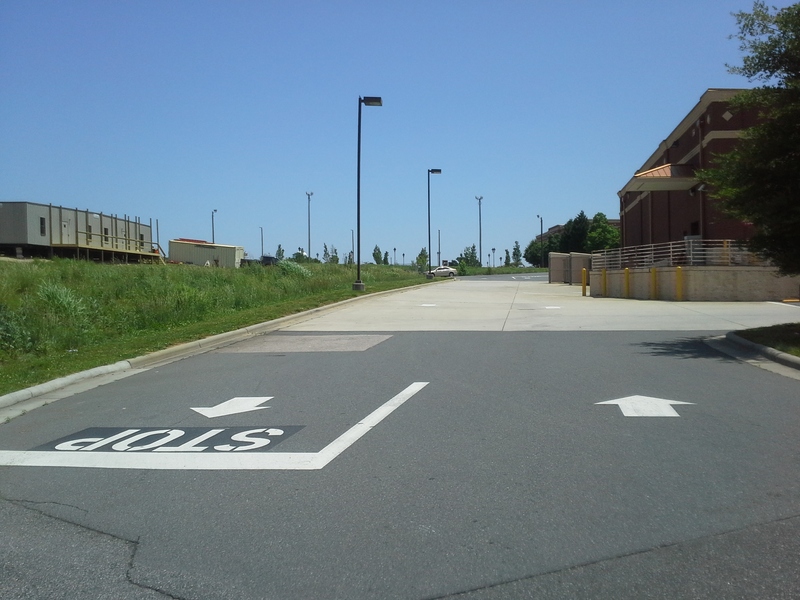 Since most people in Kannapolis probably don’t know how to use a two-stage left turn box, Kannapolis would need to install the below sign to educate people, especially motorists and cyclists, on how to use the two-stage left turn box. After turning left onto South Walnut Street, cyclists could bike on Rite Aid’s private road, which is located behind Rite Aid and connects to South Juniper Street. 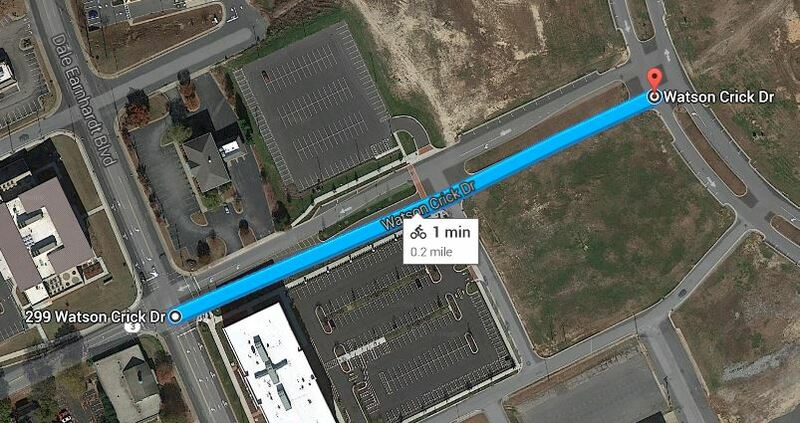 Several cyclists from the Central Carolina Cycling Club told me they already use this route so the City of Kannapolis could work with Rite Aid to make this a public-private sponsored bike route by installing multiple sharrows and Bikes May Use Full Lane signs. These sharrows and Bikes May Use Full Lane signs would direct cyclists where they need to be on the road and inform both cyclists and motorists where to expect cyclists to be biking. Since few automobiles use this route, which I know because I took several photos while standing in the middle of the road, and the automobiles that do use the route are traveling so slow, this route would provide a safe alternative to biking on Dale Earnhardt Blvd. Put sharrows and Bikes May Use Full Lane signs on it! 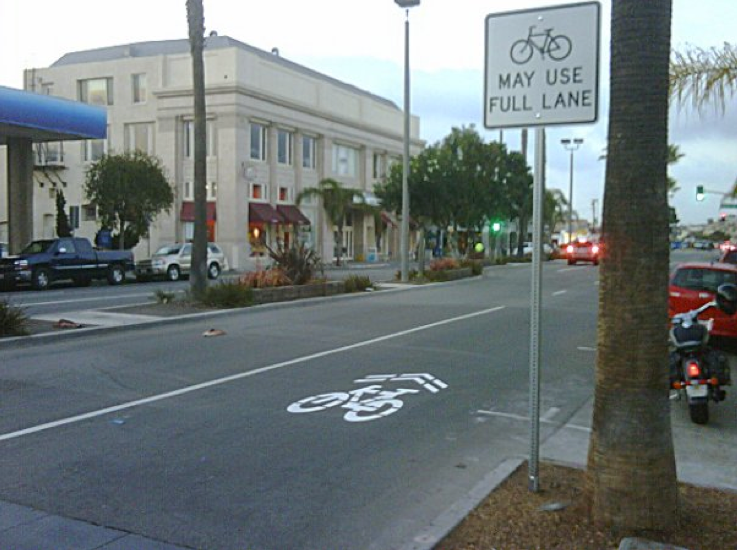 Here is an example of what a sharrow is and what the Bikes May Use Full Lane sign looks like. Notice how the sharrow is properly installed outside the door zone. I see too may sharrows installed in the door zone so it is nice to see a properly installed sharrow. 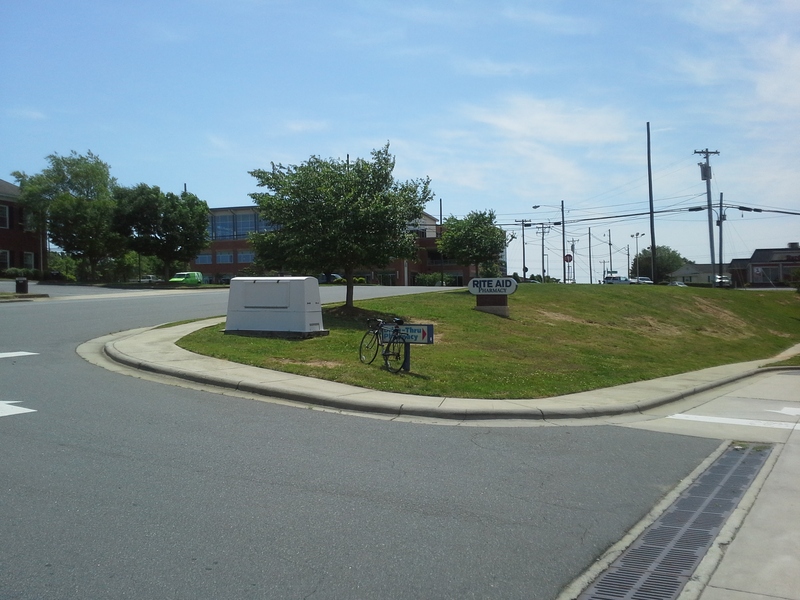 After biking on Rite Aid’s private road, cyclists would turn right onto South Juniper Street then turn left onto Southern Select Community Credit Union’s parking lot. Sharrows and Bikes May Use Full Lane signs can continue to be used. Additional wayfinding may be needed if the sharrows don’t provide enough direction for cyclists to know where to turn. 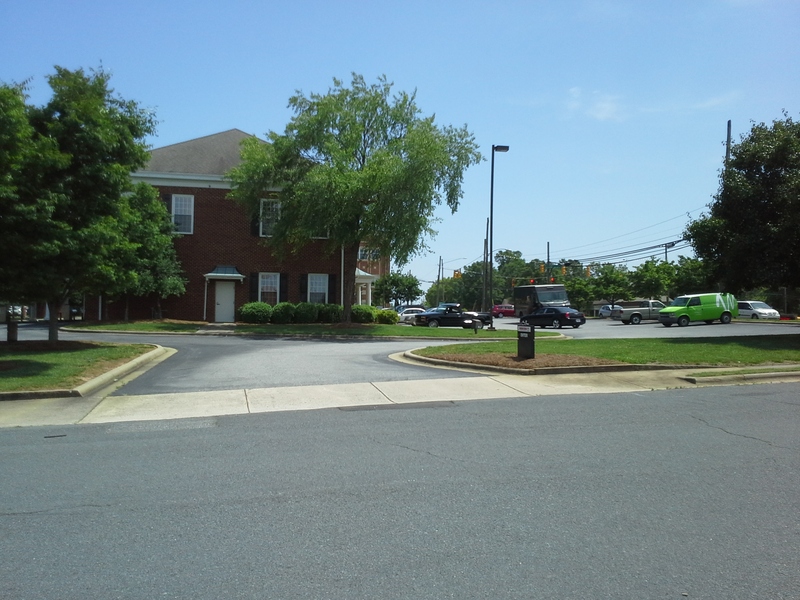 The alternative route concludes on the other side of Southern Select Community Credit Union’s parking lot, which connects to Watson Crick Drive. Watson Crick Drive changes names to Mooresville Road beyond the below intersection so the alternative route is complete. I am hopeful that the City of Kannapolis and NCDOT can work together to make sure the proposed wider outside travel lanes for cyclists on Mooresville Road will be extended to where Watson Crick Drive intersects Laureate Way. My proposed alternative route, along with suggested redesigns, should encourage “interested but concerned” cyclists to bike between where the buffered bike lanes end on Loop Road and the wider outside travel lanes for cyclists start on Mooresville Road. Whether or not my proposed alternative route is considered by the City of Kannapolis or NCDOT, I am hopeful that the City of Kannapolis and NCDOT can work together to make sure there is a safe and convenient bike connection between the Loop Road project and the Mooresville Road project. How feasible do you think my plan is? Are there areas I can improve my plan? Since I will be moving from Kannapolis, NC to Silver Spring, MD on Sunday for a transportation planning internship with Toole Design Group, my next post will discuss my expectations for living car-free in the Washington, DC region. Since I have been dependent on an automobile for nearly every trip in Kannapolis and this is my first time moving outside the Charlotte region, I am confident that I will experience challenges. However, I also expect to experience many benefits from living car-free in the Washington, DC region.